↑ "DPR Korea 2008 Population Census National Report" (PDF). Pyongyang: DPRK Central Bureau of Statistics. 2009. p. 14. Archived from the original (PDF) on 31 ᱢᱟᱨᱪ 2010. Retrieved 19 ᱯᱷᱮᱵᱽᱨᱩᱣᱟᱨᱤ 2011. ↑ "National Accounts Main Aggregate Database". United Nations Statistics Division. ᱰᱤᱥᱮᱢᱵᱚᱨ 2012. Archived from the original on 5 ᱯᱷᱮᱵᱽᱨᱩᱣᱟᱨᱤ 2016. 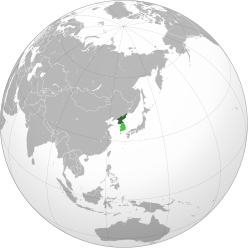 ↑ "Decree on Redesignating Pyongyang Time". Naenara. 30 ᱮᱯᱨᱤᱞ 2018. Retrieved 4 ᱢᱮ 2018.